The HEKA Standard series of incubators impress with their warm, comfortable vibrancy of the natural wooden finish. The frame is manufactured from premium-quality, seasoned, solid wood. The rest of the body is made of 21mm-laminated wood, which is coated and glue laminated to be extremely water-resistant. Due to the high quality of the materials used, the cabinet is exceedingly durable and long-lasting. Electronic, electrical and control components are selected for quality, durability and longevity. The operating-life has been experienced to be 20-30 years, resulting in high market prices for used HEKA-incubators. The manufacturing quality of HEKA-incubators is at a consistently high standard. HEKA incubators are designed to be technically and aesthetically high standard. We maintain a high attention to detail in the cabinet making, for example, how the door sits flush against and accurately against the side mouldings. This ensures that the product will function to the best possible level and remain doing so throughout its lifetime. 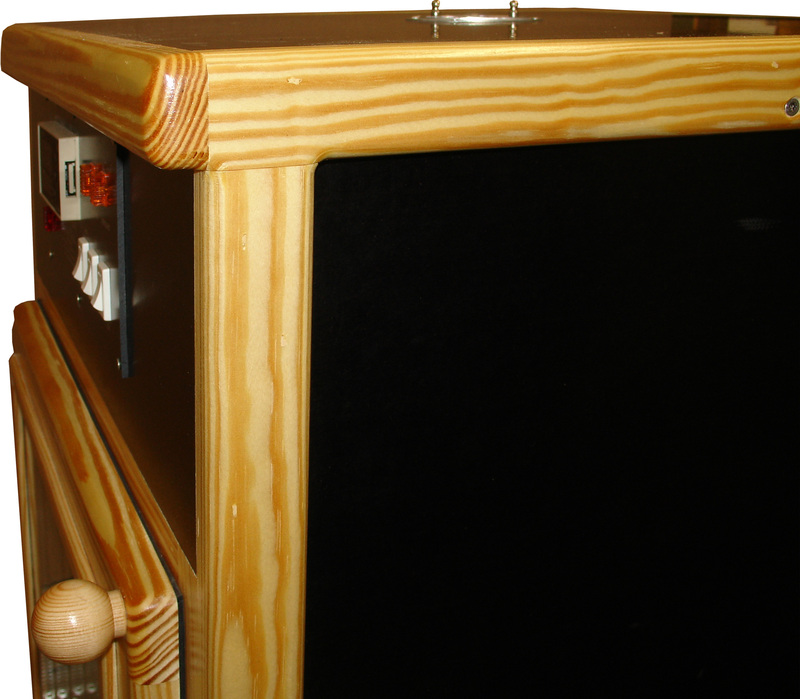 Cables, electronic and electrical components are installed in a tidy and robust manner.The sensitive electronic-system of regulation is separated from the rest of the incubator and the use of cable glands ensures that the humidity, which is created inside the incubator, does not affect the electronic-system of regulation. All incubators from HEKA are designed with a forced air circulation system to ensure an optimum dispersion of the air is created. We achieve this with a double-walled cabin as well as with premium-quality, powerful fans (adjusted in size for each model), which blow the air down from the technical compartment and which then let the air flow through the side channel upwards again. This results in a maximum of temperature constancy in the different layers of the incubator as well as on different sides of the incubator. There is no need to redistribute the eggs because of different temperatures inside the incubator when using a HEKA incubator. Humidity is generated in the Standard Series incubators with a three-part water-basin, which is placed at the bottom of the incubator. These water-basins are available in different sizes, so that e.g. for brooding hen-eggs, you reach just the right values of humidity, if you fill one compartment of the water-basin in the first 18 days - and then in the last 3 days of hatching 2-3 compartments. 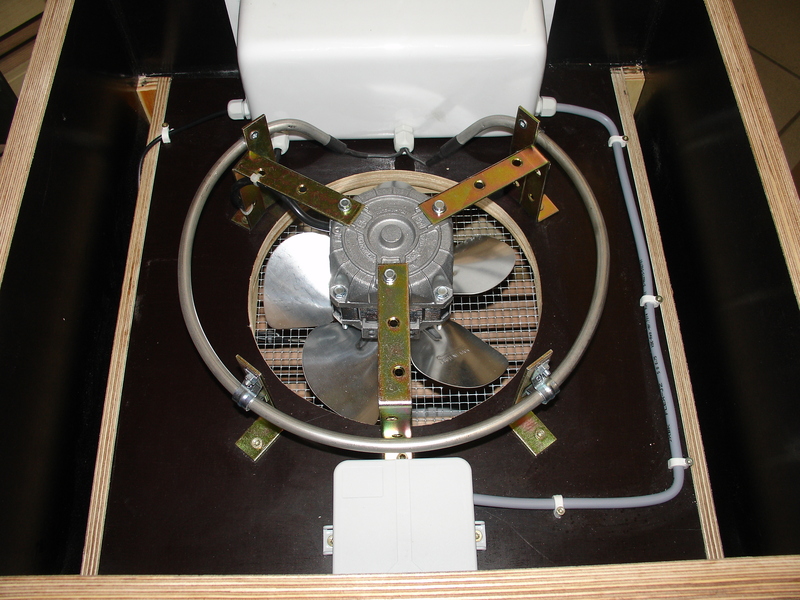 For fine-adjustment there is an air-vent in the cover of the incubator, with which you can regulate the exchange of air quantity and thus the supply of oxygen. At the door of the incubator, there is a hygrometer for checking the humidity - and of course, there is a table for the required humidity for different kinds of poultry in the manual, which is supplied with every incubator.